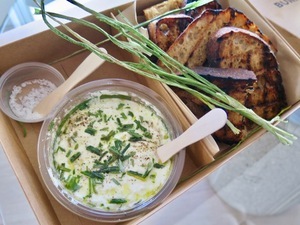 Young Fava’s burrata-spring onion dip. Photo: © tablehopper.com. The MF Chicken spread you can enjoy at home. Photo: © tablehopper.com. If you follow me on Instagram, then you already know chef Anthony Strong’s ~YOUNG FAVA~ started a trial of its delivery service over the weekend. The official delivery start date is this Thursday June 22nd, and you’ll be able to order truly delicious dishes like burrata-spring onion dip (perfect for a party appetizer) and my personal fave, the chicken lettuce wraps “Parma style” with a Bolognese of Mary’s chicken with pancetta and green garlic, served with Parmigiano crisps. It’s like having restaurant-quality food delivered to your door, all the way down to the exclusive Josey Baker bread Strong is using (called Rustic Blunt, ha-ha-ha). The salads are so good and full of flavor, and everything is built to travel well. Look for more mains and prix-fixe dinners to be added to the menu too. Young Fava is on UberEats for the moment and will be adding Caviar, Postmates, and more, plus pickup is available (at Turtle Tower, 645 Larkin St.). Hours will be Wed-Sun 6pm-10:30pm. Another addition to the delivery game is ~MF CHICKEN~ from the Tacolicious crew, which just launched last night. 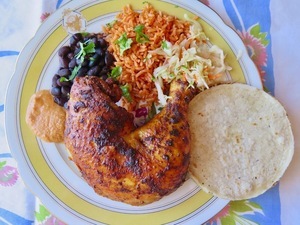 It’s all about getting a complete meal of Mexican-style rotisserie chicken with sides, all made with quality ingredients. Extremely juicy Rocky chickens are rubbed with a spicy, tangy ancho chile-based marinade that will get all over your fingers, but fortunately they come with Wet-Naps. The birds also come with excellent sides: creamy Rancho Gordo black midnight beans, some of the tastiest Mexican rice I’ve had in some time (made with Rue & Forsman long-grain), a stack of fresh La Palma tortillas, and chopped onions, cilantro, curtido (zippy cabbage slaw), and their housemade “orange sauce” inspired by La Victoria in San Jose. You can get a half or whole chicken, for $17 or $32, on Caviar, and here’s my code for first-time users to get $20 off. Even better: order in the first 10 days (the clock started ticking last night, June 19th! ), and MF Chicken will include free delivery plus 30 percent off a whole or half-chicken meal. Delivery service is for dinner-only (for now), 4pm-10pm. Lunch coming soon. Bwok.